Dr. Resham Patel, from Richlands, VA earned her Bachelors of Science degree from the University of Virginia where she discovered her passion for dentistry. 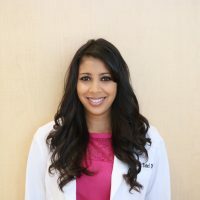 She went on to complete her dental school training at the University of Pennsylvania School of Dental Medicine in Philadelphia, PA. After completing four years of training at UPenn, Dr. Patel went on to further specialize her skills in a two year general practice residency at Cornell/New York Presbyterian Hospital in New York City. In her residency, she completed training in pediatrics, cosmetics, complex restorative as well as implant dentistry, endodontics, and the management of medically compromised patients. Dr. Patel spent the last several years practicing dentistry in Manhattan before ultimately deciding to continue her career down south. She now lives in Durham, NC with her husband Nick and miniature dachshund Sophie. In her free time, she enjoys traveling, cooking, and spending quality time with family and friends. Dr. Patel looks forward to meeting with you, brightening your day, and bringing out your best smile!